CRANBERRY TWP., Pa. — The Slippery Rock Pride hosted the West Virginia Mountaineers Friday night at UPMC Lemeiux Sports Complex and came away with the victory, 8-5. A wild first period saw WVU open the scoring off of a faceoff in the Mountaineers defensive zone. Although Slippery Rock won the faceoff, they couldn’t corral the puck at the blue line and Antonio Avallone took it end-to-end to give West Virginia the lead less than 30 seconds in. Four minutes later, Luke Grossman tied the game for the Pride. West Virginia put two goals in just 17 seconds apart for the 3-1 lead before Shane Riley and Nate Mettenburg tied the game again for the Pride. Jeremy Judis gave the Mountaineers a 4-3 lead with less than three minutes to play in the first period. The second period was noticeably calmer, with only a single goal scored by Slippery Rock forward Antonio Esposito, who tied the game at four goals apiece 59 seconds into the period. Slippery Rock fought through to the intermission without allowing a goal. Early in the third period, Thomas Kimmick, who sits in second place in scoring in the ACHA, put the Pride up by a goal just over four minutes in. Esposito notched his second of the game 29 seconds later, the technical game-winner, to make the advantage two. Riley notched his own second goal a few minutes later, Eric Keefe attempted a Mountaineer comeback, but Mettenburg also doubled up his goals for the game, scoring in the empty net with 10 seconds to play. Jon Szynalski made 28 saves on 33 shots in the winning effort. 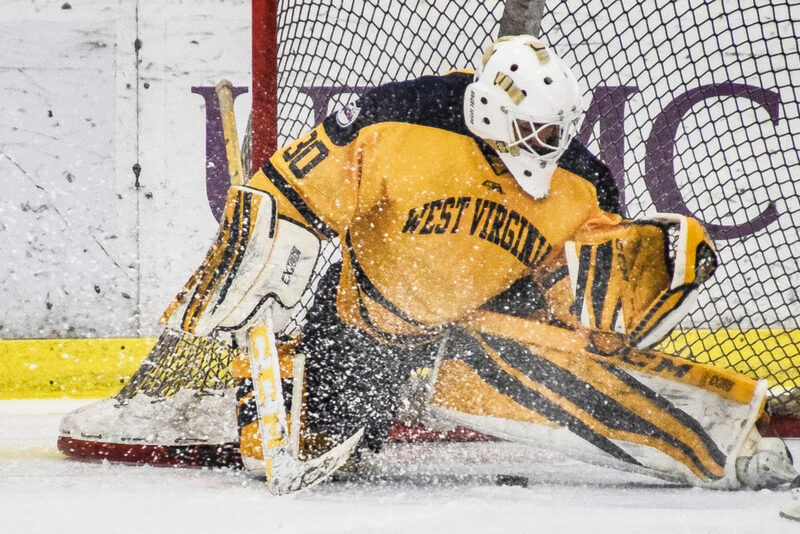 Mountaineers goaltender Banjamin Zienty stopped 48 out of 56 shots. To see more coverage from Edward you can follow him on Instagram, Facebook, or Twitter. As always, full galleries can be viewed on hi website. IUP moved back to a tie for the conference lead with Duquesne with their win over Mercyhurst Friday night. Slippery Rock has two conference games remaining this calendar year. Winning them both will tie them with Duquesne and IUP for the lead. They would own the tiebreaker having the head-to-head tiebreakers over both squads. West Virginia remains winless in conference play and the Pitt Panthers are surging towards the top of the standings, winning five of their last six games.